My most recent boxes (that are all still on the dining room table) have been my Spring 2015 FabFitFun box, Spring 2015 Walmart Beauty box, and my March Birchbox. My April Birchbox is on its way and should be arriving on Tuesday. The FabFitFun box has some great items in it this time. But I do expect that, as it costs more and comes quarterly. That scarf (left side of the photo) is so pretty and makes me wish that I felt more comfortable wearing scarves (or had more things to wear them with?) I need to get over that. Peep the info card here for details on everything inside. The Walmart Beauty Box was also pretty good this time. It was more focused on skin care than cosmetics this time, but that’s ok with me. I get my makeup fix through ipsy and birchbox. 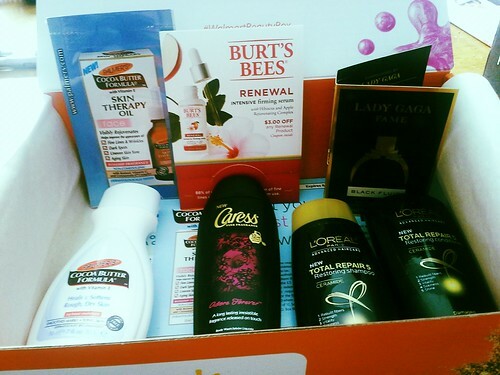 I am really excited to try that body wash. I’m all about smelling good. 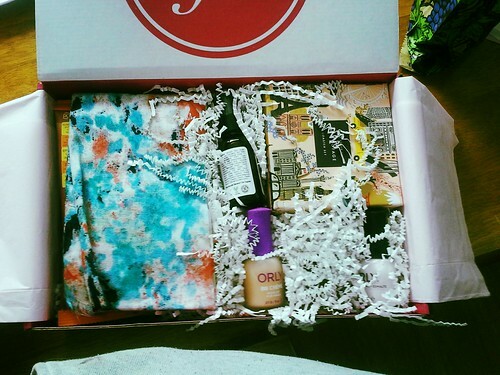 And speaking of Birchbox… I had intended to film an unboxing video and so I never unpacked the box. I’m now wondering if I should just give up on that idea. I want to start using the things! Not that I remember anything that was in it aside from a blush that I’m really looking forward to trying. I’m thinking I should set a deadline for videos. If it’s not recorded within the first few days, it’s probably not going to happen and I should just open it already. 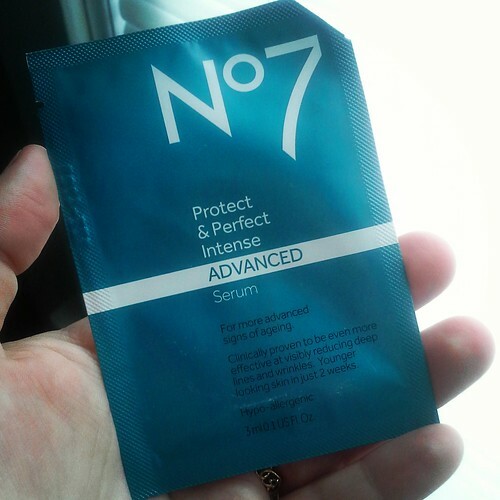 In my Influenster Frosty VoxBox, I received a packet sample of the No7 Protect & Perfect Intense Advanced Serum. Due to the size of the sample (and the $29.99 cost of the full size,) This review is a bit limited. I can give my first impressions but cannot speak for its long-term effects. The first thing I noticed about it was the texture. It has that matte-slippery feel of a primer. It goes on very smoothly and leaves the skin feeling very soft and slightly slippery. But not wet or greasy. Again, like a primer. It did not have a noticeable scent. It changed the feel of the application of my moisturizer. Not in a bad or unpleasant way. It was very smooth. I have not had any major breakouts but I have noticed more of those tiny little pus bubbles forming. Sorry. I know that sounds so gross. But I don’t know how to better describe them. I have not noticed any other differences in the look of my skin. With the price and the minimal breaking out that I’ve experienced, I’m not feeling very motivated to purchase the full size of this, even with the $2 coupon that was included with my sample. Red Vines Fruit Vines Bites Strawberry Flavor – 5 oz. McCormick Gourmet All Natural Thyme – .62 oz. So far, I have had the chance to try the NYC lipstick and the Rimmel eye makeup remover. I’ll review those soon. I feel positive feelings about both so far. I’ve had Candy Cane Lane before and I know that I like that. I look forward to trying all of the things in this box, with perhaps the exception of the brush. I’m pretty attached to my Mason Pearson. I’ll still give it a try though! Looks, smells, and feels like some sort of sweet and spicy pumpkin dessert. Definitely like something I would eat. Well, maybe not me. I’m not into pumpkin desserts. But if you are, you’d want to eat something that smelled like this! It says on the jar that it will tingle. It does a little. And it felt just a tiny bit stingy at first on a couple breakout spots. My skin is not happy with me lately. I don’t blame it. I’ve been drinking too much, out in the sun too much, not washing it as obsessively as usual, etc. Shame on me! The box says to leave it on for 5 minutes and then rinse off. I should have noted when I put it on but I didn’t. I’ll go shower in a few and hope I guessed correctly. After the first minute or so, the tingling goes away. It’s easy to forget I have anything on. I’d like to say that my face felt different and glowy after I rinsed it off but it, uh, didn’t. It also didn’t make anything go wrong with my skin so far. So that’s good. And I do feel smooth and not terribly greasy. But, I’d have to say that I don’t notice any immediate effects from using this peel. I recently saw a post on BellaSugar and it has brought to my attention another product that I think I just have to have. I’m kind of a freak about my skin care. When I was younger I didn’t like my skin at all, and even now, we still have days that we don’t get along so well. From what I have read, the Clarisonic might be the answer to a more peaceful relationship with my skin. Sadly, the high price tag on this ($167 on amazon and close to $200 on other sites) means I will be lusting for and drooling over this for a while yet to come. Anyone else have experience using it? Do you love it? Hate it? Feel eh about it?